Mighty Raju is the character from Chhota Bheem. He is the small kid with two strands of hair and two teeth. The character became so popular that Mighty Raju came into existence as a full fledges cartoon character. Here is how you can draw Mighty Raju cartoon. Mighty Raju drawing made easy through Drawing Manager. Mighty Raju enjoys a separate identity now and he is not known as the friend of Chhota Bheem, instead he has made his own name and place in the heart of the kids. Now, that you have your kids jumping around behaving like Mighty Raju and wants to draw the cartoon character of Mighty Raju, you can surprise them by drawing the character all by yourself. Your kids will love the effort that you will put in to provide them with the sketch of mighty Raju. Raju doesn’t need Chhota Bheem to help him out when he is in danger because now he has some powers of his own, which he can put to use to bail him out from the danger. Chhota Bheem Drawing would also be useful for kids. It is simple to draw Mighty Raju character which is about a small boy in diaper, but in Mighty Raju, he has this wonderful costume and he also goes to school where he has fun with new friends in his class. If he finds someone doing some mischief, then he takes out his hidden talent and solves the problem. Now, enough about mighty Raju, let’s get started with the drawing of the cartoon character. If you want to draw cartoon character of Mighty Raju, then you will have to follow the below mentioned steps carefully. They are explained in the easiest possible way, so that you can draw the sketch comfortably. To draw the frame of the goggles you will have to draw an outline and on to complete the head gear you will have to draw two lines parallel to each other. 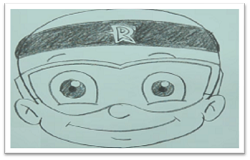 In the middle of the lines, Write R. It is now time to color the cartoon sketch of Mighty Raju and finish the look of this quite popular animated character which has come of age and enjoy a share of fan of his own. I hope Mighty Raju drawing would be easy for you. The complete steps to draw Mighty Raju in complete details are already explained above.